COLORADO HORSE CONNECTION MAGAZINE – THANK YOU TO ALL OUR MEDIA PARTNERS ! 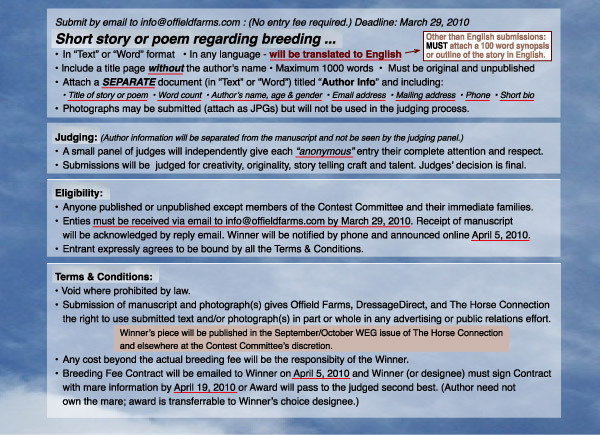 Celebrate the world of breeding: the Winner of the Lingh story contest now announced! DD-Lingh ExclusiveBreeding is in the air. Stallion selections, stallion shows and stallion competitions are everywhere. Breeders all live their dream, visioning their dream to be born soon. Or to be born next year! The perfect time to come back on written dreams in words, stories and poems. 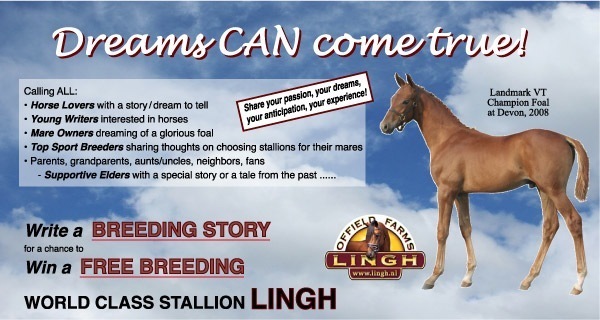 What an amazing contest it was: write your favourite story on breeding and win a free covering from the all exciting Lingh! Lingh, the stallion Karin Offield fell in love with when Edward Gal rode him to the win in Grand Prix in Las Vegas in 2005 and now owns herself.Front dream stallion Lingh Picture Arnd Bronkhorstwww.arnd.nlKarin Offield didn’t sleep when all kind of stories and poems arrived, from the USA of course, but also from Sweden and The Netherlands. Karin Offield explains: “It was an amazing experience for me! I can count on one hand the foals and mares I have had in my career. Now, because of this contest I have had a front row seat in all these amazing stories. Most were non fiction and all of them celebrate the world of breeding horses – what happens, how it happens, when it happens and the effect these gentle creatures and their babies have on us, our psyche, on our hearts and how we have to be, the human race as thick skinned as any animal lover is….our big big horses are so fragile, but it’s all about the adventure…the dream. This Lingh Story Contest celebrates this world! I want to congratulate every entrant and have called them all personally. Lots of stories, lots of emotions we have shared. This has made me very happy!”The stories made Karin Offield very happy Photo by Marielle Andersson www.andersson-fotodesign.comWriters sent in multi lingual submissions, stories and poems about the passion of Breeding. The judges panel consisted of two American breeding experts, Tish Quirk of Carlsbad, California and Kathy Hickerson of Brookline, New Hampshire. The European panel consisted of Claartje Van Andel of the Amsterdam Area, Netherlands, dressagedirect’s owner, a professional Teacher of Language and Communications Expert. Karin Offield also asked Maucca Karki in the panel, Finnish born but living in the Netherlands too and a Breeder and Equestrian Consultant. The judges were sent each entry without knowing the author’s name or background. Lingh’s owner Karin was the data technician who accepted and distributed the anonymous submissions to the judges. Karin was not a participant in the judging of the contest that began one year go in the early spring, February 19th 2010.The winner! Mary Bahniuk Lauritsen is an accomplished FEI Young Rider reigning from Harvard, Massachusetts. Mary is currently balancing her riding and education while she attends Emmanuel College in Boston. Mary has been actively competing in dressage since she was nine years old and has successfully shown up to Prix St. Georges. Mary is active within the sport in and out of the saddle. She has been serving as the United States Dressage Federation’s Youth Executive Board President for a year and truly enjoys giving back to young riders across the nation as well as promoting the sport of dressage. Mary is one of seven members on the Dressage Trainers network where members share a common interest in teaching and growing as individual equestrians. Outside of riding Mary enjoys traveling, vegetarian cuisine, social networking, and modeling. Mary was very excited to know she was chosen as the winner! Karin Offield now can’t wait to see Dutch breeders to breed their best mares to Lingh and she is very happy to have Lingh incorporated in the breeding facilities Birkhof in the southern part of Germany this year. I remember it as if it were yesterday. My heart stood still as my eyes followed the graceful pair around the warm-up arena. My heart then began to beat again with each change of lead, every change straight, uphill, and as if the footing beneath his hooves had turned into springs. Not any of his fellow competitors kept me so entranced. It was this beautiful bay stallion, his electric legs, and focused eye that hypnotized not only myself but also those surrounding me on the sides of the World Equestrian Games warm-up arena in Aachen, Germany summer of 2006. Like a photo hungry paparazzi photographer, I filmed Lingh in his warm-up and in competition, my hand shaking in excitement, making these films quite unenjoyable to watch once arriving back in the states. I just wanted to capture the moment and remember it forever, shaky footage or not. Racing back and fourth from warm-up to the incredible Aachen stadium to witness his Grand Prix tests, I felt everyone else should have been doing the same, this horse exemplified so much and his partnership with Edward was intoxicating. It was the evening of the freestyles that would leave an even deeper mark in my teenage equestrian years. With over 60,000 spectators and only standing room left for viewing, my friends and family had found a perfect spot along the long side of the stadium to stand and watch the best in our sport compete in the most exciting event of the three days of competition. With the towering lights gleaming and a Germany summer’s cool spilling over the brimming stadium, he entered the arena. I could compare myself to one of those 1960’s Elvis-crazy teenagers you see in vintage films, the moment I saw his passaging legs dance through the gates and begin around the arena. The trance started, the pulsating beat of his freestyle woke up the crowd and murmuring and cheers could be heard as Lingh’s extended trot took him across the diagonal after his dramatic entrance. How fitting it was to have trance music for this horse because this is what this animal had down to me and the other 60,000 spectators. He had left us entranced. It was with this performance that I saw Lingh in person for the last time. His beauty and magnificence would never leave my memory after this week spent in Aachen. To this day I can look back and savour the moments I spent watching Lingh in Aachen and feel fortunate to have been left entranced by such a magnificent animal. Linghs beauty and magnificence would never leave my memory, Mary Bahniuk says. 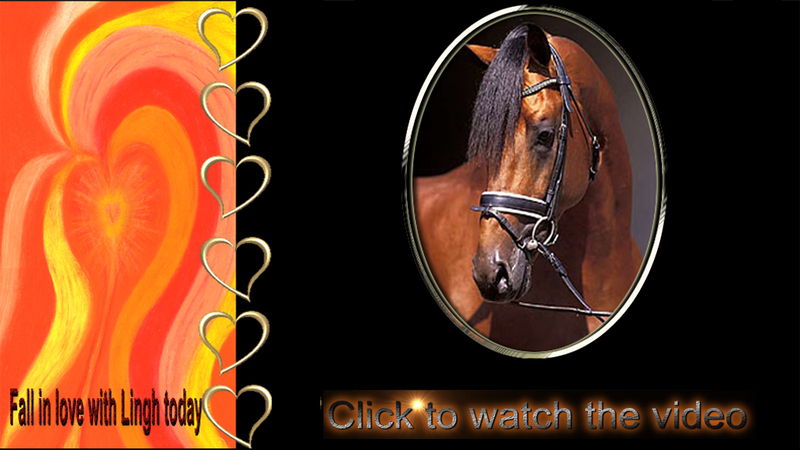 www.dressagedirect.com Click here to unsubscribe. Some times it takes a long time to get things done in life, and announcing the winners of the 2010 Lingh Story Contest is one of those events. My wish for the entries was that their stories would be read around the world. The winners were to be announced and the stories published during the time of WEG because the winning story was about Lingh and the 2006 Equestrian Games in Aachen, Germany.So today, the second place winner is being announced. The winners were chosen by the panel of 4 judges that included 2 American breeding experts and 2 European journalists. The second winning entry was also about Lingh and the story is set during the infamous Las Vegas World Cup in 2005. To be fair, since the Lingh Story Contest was created by me, the contest clearly did not require that Lingh be involved at all in the story lines. I remember the night (Easter 2010) when I received the judges decisions. I was so excited that the contest was complete but I was astonished that Lingh was the star of both the winning and second place stories.So as I trot out the stories on http://www.lingh.nl , Story Contest…grab your kleenex and tissues and enjoy the wonder of breeding stories. It was a great contest, it involved really hard work by all and next time Lingh will need to learn how to be the data tech…. “Are you OK? Why are you crying?” my friend whispered in concern. I just shook my head and gasped for breath, eyes following every movement of the bay stallion as he performed a near flawless half-pass. I couldn’t breathe – couldn’t talk. True, I was and still am strictly an amateur to the sport of Dressage, but I knew enough to know I was witnessing something truly exceptional, a performance to be remembered for a lifetime. At the end of the performance I turned to my friend – herself an FEI competitor and smiled. “Why do YOU have tears on your cheeks?” I asked. “Yeah…kinda gets to you doesn’t it?” she admitted with a sigh. “Oh yeah! Definitely. That was …incredible. That’s what dressage is suppose to look like. What we’re all striving to achieve” she said in pure admiration. “Wow….just…wow. That was…wow.” She repeated, unable to find the words, I nodded – understanding exactly what she meant. We both thought Lingh was robbed with his scoring. Our opinions matched totally. It was the topic of many hours of discussion. We watched the video, over and over – pointing out what we felt was perfection and wondered how it would feel to obtain such a goal. Other horses were watched, critiqued, admired and compared but Lingh remained at the top of our list. You had to experience it in person. There are no words to describe the feeling that night. It simply was. A moment you felt with not only your mind, but your body and soul. Fleeting. Elusive. Cherished. Three years later I watched the Virginia Tech website closely and with interest. Two mares had been bred to Lingh. I had a limited amount of money saved…was I crazy to even contemplate attending the auction? Lingh foals. Here was a possibility…a faint glimmer of a hope for a quality baby by a truly magnificent stallion. A Lingh baby! Not a world away physically and financially, but here…close. Such a dream for the likes of me! But, fate intervened. Through a series of events I found myself in possession of an unsound Hanoverian broodmare – in foal to a Hanoverian stallion with fabulous bloodlines, but unapproved, and due to money matters, the stallion was likely to not ever be taken for approval. A deal was struck with my trainer – I would get the foal, she would take the mare in exchange for training for my appaloosa gelding. A gorgeous filly was born and instantly won my heart. She had the Olympic champion Weyden in her pedigree from her sire’s side, in my opinion, 2nd only to Lingh as far as being impressive to my eyes. A filly – visions of stallions danced through my mind, but they lingered on Lingh repeatedly. What if? I am in all sense of the word, a true adult amateur. Until now I have ridden and competed in Dressage at the local level only and with non-conventional breeds. I am a public servant and work to support my horse habit. Money is not abundant, but I get by. My horses don’t lack for care and I enjoy them to the max. The filly – while not properly papered for breeding with the Hanoverian Society – showed promise towards being an Upper Level horse. She was my one chance for a truly dressage bred horse of quality, especially since I am beginning to see the other side of 50 and have my own soundness issues. The thought of breeding Lingh to this mare when she was old enough was a seductive one – fun to play with but in all probability, totally unrealistic. She was everything I had wanted in a filly…powerful, correct gaits, good conformation, wonderful temperament and a quick mind. What if? The future seemed bright. The possibilities were tantalizing. Colic on New Year’s Day took my dream away. She was only 10 months old…and what if died as well. The bloodlines of two of the greatest champions would never blend for me. BUT? What if? Weyden’s blood isn’t there, but the dam is still alive and currently in foal. What if? The mare had produced a quality foal from an unproven stallion, what could she produce from a champion? The mere thought sent shivers up my spine. A far fetched fantasy for sure, I could never afford a breeding to Lingh, not on my salary. Or could I? The colic surgery had taken the money I’d put back. After a moment of thought, the spare change jug comes back out and is relabeled Lingh. It doesn’t hurt to have a dream. It’s 6am and I’ve just gotten home from the night shift. I take off my uniform; digging in my pockets and wallet for loose change and drop it into the Lingh jug with a sigh. Every penny on the ground I pick up for good luck and the Lingh jug. It was an uneventful night, but still, I find it hard to wind down. Sleep eludes me because I cannot turn my mind off. It’s been a recurring problem for years. I turn my mind to what if – as a means to calm myself and settle. I build my dream barn…ride the perfect dressage test and always end with the vision of a handsome foal by the beautiful Lingh…who made me cry from seeing beauty in motion and gasp for breath as I tried to hold onto that fleeting moment. What if I could hold onto that moment in a slightly different form – for just a little while longer? Dreams do come true sometimes – don’t’ they? What if – floats through my mind as my body relaxes and finally, finally I drift off to sleep. What if? It works – every time. Ann’s Bio: “I am in every sense of the phrase, a true “adult amateur”. Currently I am competing at the local level at 2nd Level dressage with my 16 yr old Appaloosa gelding, Skyline Firedance. My trainer and I have been together for almost 25 years. She has helped me through a number of rehab situations (including a broken back and hip replacement surgery) on a variety of different breeds of horses – none of which were ideally suited for dressage. As a former police officer and now a police dispatcher, “What If?” remains a part of my way of dealing with stress and trying to settle down for sleep after working 12 shifts. In 2005 I was honored to watch Lingh in what I considered a truly magnificent performance, and it was there in Las Vegas, that the dream began. I still get goose bumps just thinking about that performance, and tears each time I watch it on video. This email was sent to cottage37@earthlink.net by info@offieldfarms.com. ONE OF MY FAVORITE STORIES…..
All the people were gone, asleep in their beds. Her chestnut hair sweating, her stockings off-white. She could no longer sleep, she was far from discreet. She closed her eyes and let out a great call. The little mare was worn, but a new chapter would begin. She felt victorious, so proud of what was achieved. Her baby was more glorious than she could have believed. Tried to make it last, but failed to stay upright. Let out a whinny and tried to stand once more. Horses nickered in the stable as she began to prance. Looking at her mother, she continued to prance around. Her neck grew long and thick, she carried it with pride. It wouldn’t be long before she had a rider on her back. Her body she could bend, to hands she could connect. Winning even more as the tests grew more complex. It was time for a transition, time to pass on her skills. She retired from the show ring, with grace, and glory. Pregnant by the spring, she was starting a new story.